ZTE and MetroPCS today announced the Blade Z Max, a successor to last year's Z Max smartphone. ZTE is making greater use of its Blade branding on value handsets in the U.S., which is why the new phone adds "Blade" to its name. 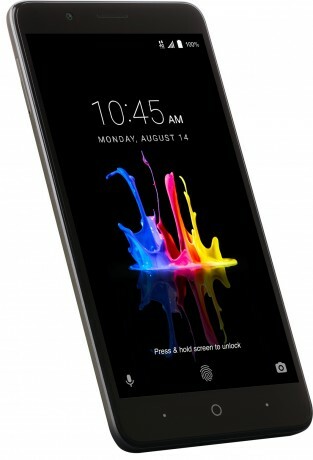 The phone relies on a metal frame and flatter rear panel that is coated with a honeycomb rubber texture for added grip. The Blade Z Max carries over the 6-inch full HD screen with 2.5D Dragontrail Glass of last year's phone, but doubles up on the cameras. The Blade Z Max has a 16-megapixel main rear camera with a secondary 2-megepixel camera to help with focus and contrast as well as create bokeh and monochrome shots. The phone includes an 8-megapixel selfie camera on front. The Blade Z Max is powered by a 1.4 GHz octa-core Snapdragon 435 processor with 2 GB of RAM and 32 GB of storage, and it supports memory cards up to 128 GB. ZTE says the phone's massive 4,080mAh battery supports up to 31 hours of talk time, and Qualcomm Quick Charge 2.0 for swifter refills. Other specs include a rear-mounted fingerprint reader, support for VoLTE and HD Voice, Bluetooth 4.2, GPS, WiFi, and USB Type-C. The ZTE Blade Z Max runs Android 7.1 Nougat and will go on sale at MetroPCS stores August 28 for $129. Looking for the biggest possible screen on the least expensive smartphone? The Blade Z Max may be what you seek, thanks to its IMAX-sized display, insane battery, dual cameras, and affordable price point. This follow-up to the affordable ZMAX Pro keeps the huge 6-inch screen, while upgrading a few key specs. It has a premium metal-frame design, fingerprint reader, huge battery, and dual-lens main camera.